New features of the iHSD impact mill technology include mechanical drive, vertical configuration, rear hatch and stone trap to reduce costs and improve reliability. 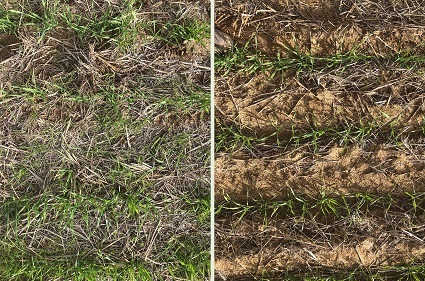 THE weed seed kill rate for both a horizontal Integrated Harrington Seed Destructor (iHSD) or the newly-released vertical configuration has been independently proven to be 98 per cent for annual ryegrass. Confirming the matching high level of seed destruction for both variants, University of Sydney Faculty of Science weed research director, Dr Michael Walsh, has been testing the efficacy of impact mills on weed seeds since the early days of development of the Harrington Seed Destructors. Back hatch view on John Deere harvester. “The vertical configuration of the iHSD mills could change the direction of the chaff flow through the mills and this could affect the processing of the chaff and potentially the efficacy of weed seed destruction,” he said. During the 2018 harvest, a wheat crop at Broomehill in Western Australia was used to test the vertical mill. Twelve 20-metre strips were marked out in the wheat crop where there was no annual ryegrass present. These plots were used to test the efficacy of the vertical mill at three different harvester speeds – 4, 6 and 8 kilometres/hour. As each plot was harvested, 5000 dyed annual ryegrass seeds were introduced into the chaff stream directly above the inlet to the right-hand side mill. The processed chaff from each plot was collected in large, fine-mesh bags attached to the righthand side outlet chute. To determine the weed seed survival rate from each plot, Dr John Broster’s team at Charles Sturt University, Wagga Wagga, New South Wales, processed subsamples from each of the 12 bags of chaff. The chaff was thinly spread on trays, covered lightly with potting mix and watered every day for four weeks to stimulate the germination of any surviving annual ryegrass seed. Each day annual ryegrass seedlings present were counted and removed from the trays. 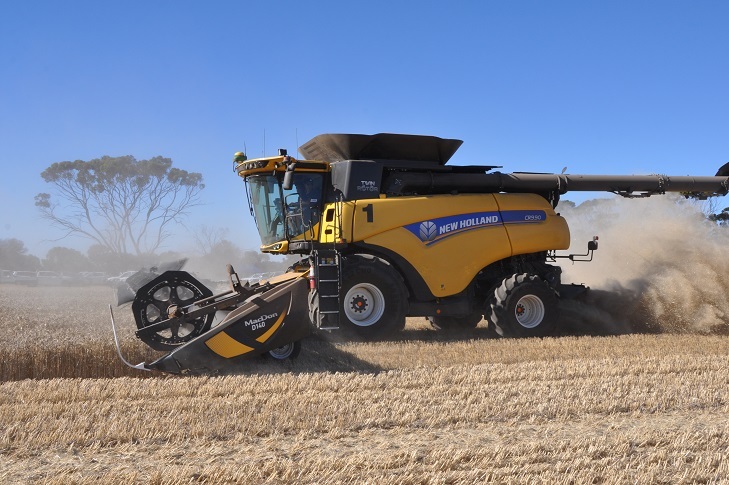 “The result of this testing was a weed seed kill rate of at least 98 per cent for the vertical iHSD impact mill, regardless of the harvester operating speed of 4, 6 or 8 km/hr,” Dr Walsh said. “This level of weed seed destruction is equivalent to that of the horizontally mounted mills that we have tested previously. Left: Without harvest weed seed control. Right: With iHSD harvest weed seed control. Weed seed destruction was 98pc or better at three operating speeds (4, 6 and 8 km/hr) with the vertical iHSD. Australian Herbicide Resistance Initiative (AHRI) and WeedSmart western extension agronomist, Peter Newman, said there was keen interest amongst Australian growers in harvester-integrated weed control solutions. “Growers are looking at price and weed seed control efficacy,” he said. “This new configuration of the iHSD provides several new features that will benefit growers, including the ability to easily check for grain loss by opening a rear hatch and disengaging the iHSD belts, the large cavity under the sieves effectively prevents bridging and the stone trap will help to prevent any foreign objects from entering and damaging the mill. Following the invention of the HSD by WA grower Ray Harrington and development by UniSA with investment from GRDC, the iHSD has undergone further development by SKF Engineering and DeBruin Engineering, together with national distributor, McIntosh Distribution. 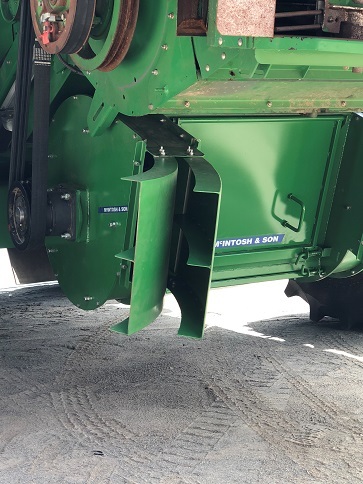 McIntosh & Son dealer principal (southern branches) Devon Gilmour said the vertical, mechanical iHSD’s direct-drive system was easy to use and maintain, could be retro-fitted on a wide range of harvester models and was easily fitted on-farm. Impact mills have a proven high weed seed kill rate, making them a very effective, non-herbicide tool in the fight against herbicide resistant weeds. Harvesters fitted with impact mills can spread crop residue more evenly, reducing the loss or redistribution of nutrients, making them an attractive proposition for growers.